🤘 HEAVY Digi-Magazine🤘Sevendust, Karnivool, Harms Way, Southeast Desert Metal and more! “It was only Morgan (Rose, drums) and John (Connolly, guitar)… there wasn’t a band yet”, recalled Sevendust vocalist Lajon Witherspoon of his first introduction to what were to become his bandmates for the next 25 years. 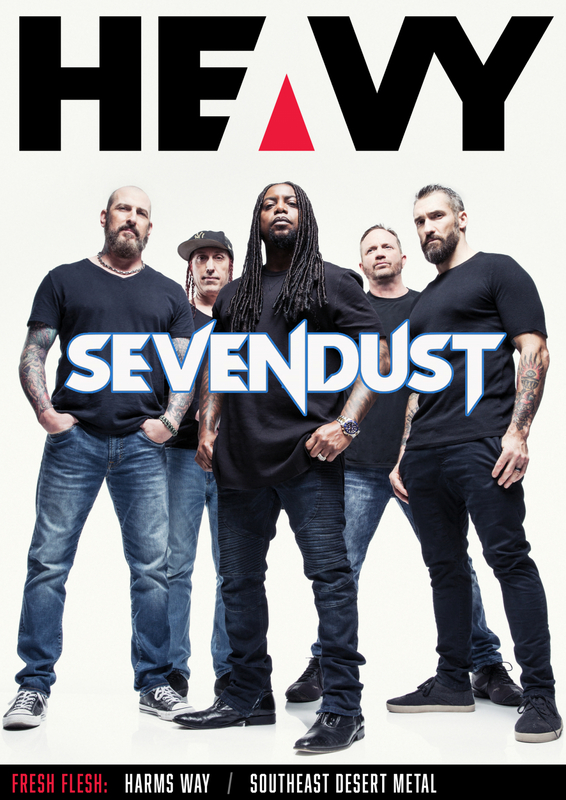 “They came to a bar I was working at – and this is a true story – and it … The post Preparing For War with SEVENDUST appeared first on HEAVY Music & Film Magazine. As the fields begin to empty and all the miniature city [tents] we’d built days before come down, I watch the sun hit now vacant spaces I’d known as my home for the last 4 days. Reflecting on my experiences over this long weekend and just what this festival means to not only me but … The post The UNIFY Gathering 2019 in Review appeared first on HEAVY Music & Film Magazine. Music often imitates life in that a bands sound is generally a product of their environment. Every harsh reality is transferred into a feeling that resonates long after the final chord or vocal line is spat in anger, and every subtle moment of beauty captured in a timeless art form that stamps your musical footprint … The post Breaking the Silence with SOUTHEAST DESERT METAL appeared first on HEAVY Music & Film Magazine. HEAVY Magazine and Beats Cartel are proud to present, for the first time in Australia, psychedelic-hard-rockers from Greece, 1000MODS! Leaders of the now-legendary Greek heavy rock scene 1000MODS have shared the stage with some of the world’s largest acts including The Black Keys, Mastodon, The Black Angels and Graveyard. 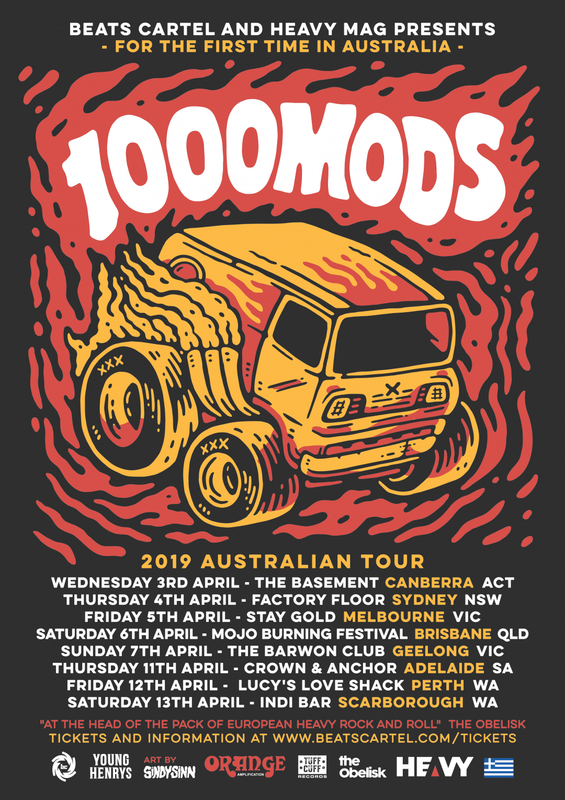 The last few years have included … The post Greek Rockers, 1000MODS, Announce First Ever Australian Tour appeared first on HEAVY Music & Film Magazine. Monica chats with Drew and Hoss from KARNIVOOL about their dedicated fans, the songwriting process, life’s moments when performing overseas, developments on the next album, and whether there really is a secret alternate playing order for their album “Asymmetry”! SUBSCRIBE TO HEAVY TV ON YOUTUBE!!! Interviewer: Monica Strut Video, audio + edit: Mark Hoffmann The post KARNIVOOL Interview with HEAVY TV @ UNIFY Gathering 2019 appeared first on HEAVY Music & Film Magazine. Batten down the hatches Australia those fun-loving pirate metallers Alestorm are heading back to our shores and boy (or should that be buoy?) do they have some wild times planned for their Down Under fans. When HEAVY Mag catches up with front-man Christopher Bowes he is in the middle of a song-writing session but quickly … The post Batten Down The Hatches It’s ALESTORM appeared first on HEAVY Music & Film Magazine. Monica got on the couch with Sam and Dale from OCEAN GROVE to talk about all things touring, albums, line up changes, Japan and the struggles of a vegetarian life. SUBSCRIBE TO HEAVY YOUTUBE!!!! The post OCEAN GROVE Interview on HEAVY TV @ Unify The Gathering 2019 appeared first on HEAVY Music & Film Magazine. Monica chats to the guys from UNDEROATH, covering their longevity, getting along on tour, playing Monopoly and what’s to come in 2019. SUBSCRIBE TO HEAVY YOUTUBE!!!! The post UNDEROATH Interview with HEAVY TV @ Unify The Gathering 2019 appeared first on HEAVY Music & Film Magazine. In 2018, Reef released their stunning album “Revelation”, the first in 18 years, and are now continuing their comeback with the live album “In Motion (Live From Hammersmith)”. The show was recorded on May 6th at the legendary Hammersmith Apollo in London as part of the “Britrock Must Be Destroyed Tour” (amongst other 90’s britrock … The post REEF Announce New Live Album appeared first on HEAVY Music & Film Magazine. Byron Bay lads Sunrose have dropped a new single Too High To Say Hello ahead of their single launch this Saturday and a national tour with The Getaway Plan and Dream On Dreamer. Check out their fuzzy new song here: Check them out on tour: TOUR DATES **National support Ocean Sleeper** Friday 1st February Uni Bar … The post SUNROSE New Song Out Before their THE GETAWAY PLAN & DREAM ON DREAMER Tour appeared first on HEAVY Music & Film Magazine. Sydney based Punk legends Whatever, Forever have announced a run of upcoming shows in Brisbane. The band will be tearing up the stage at Crowbar on 9th February alongside Greywood, Vitals and Grizzlyshark. They will also be playing an all ages show at 38 Berwick St on Sunday 10th. Whatever, Forever have been a consistently evolving machine since their inception in the dawn … The post WHATEVER, FOREVER To Hit Brisbane appeared first on HEAVY Music & Film Magazine. M. Night Shyamalan returns with Glass and now the cast of the film take us behind the scenes. So sit back and enjoy as Sarah Paulson (12 Years A Slave, American Horror Story), James McAvoy (Filth, The Last King Of Scotland) and Samuel L. Jackson (Pulp Fiction, Jackie Brown) take us behind the scenes. The post GLASS Cast Take Us Behind The Scenes appeared first on HEAVY Music & Film Magazine.